Community cooperation turns a traffic jam into an opportunity for fun in this inventive counting book starring a pair of clever canine siblings. 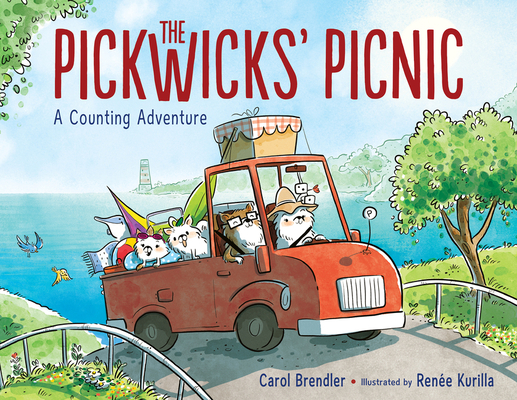 In this highly original counting tale, the Pickwicks—Pip and Peach, Mom and Daddy—leave the hot hazy city for a picnic by the shore. Along the way, they are passed by 2 scooters, 3 jeeps, and more—until they hit a sudden roadblock of 10 cruisers. Traffic stops and drivers grow grumpy, but Pip and Peach know exactly how to turn an unexpected glitch into a festive occasion for everyone! Engaging rhythm and detail-filled art reward repeated readings of Carol Brendler and Renée Kurilla’s countable account of a very special picnic. Carol Brendler is the author of picture books and novels for middle grade readers. She lives near Chicago, IL. Visit her online at carolbrendlerbooks.com and on Twitter @expectorchids. Renée Kurilla has illustrated many books for children, including Orangutanka: A Story in Poems, by Margarita Engle, and the Zebrafish graphic novel series. She lives just south of Boston. Visit her online at kurillastration.com and on Twitter and Instagram @reneekurilla.